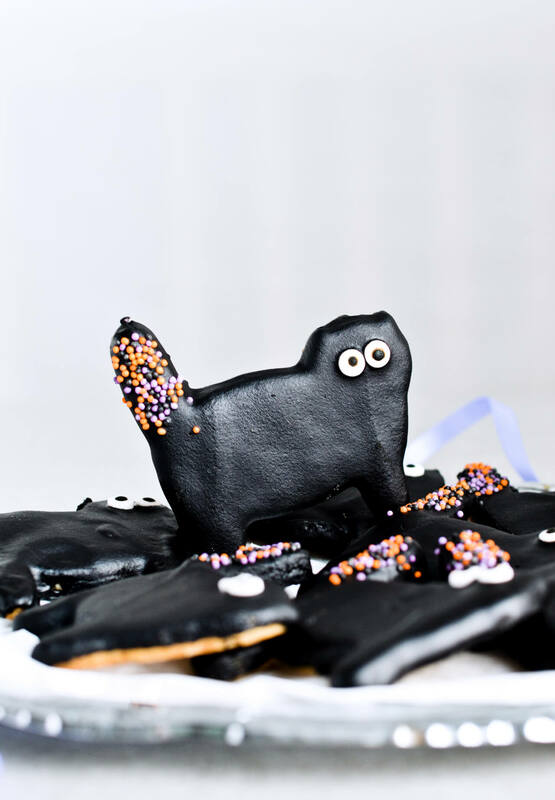 Have a catty Halloween, make dark chocolate cat cookies! Happy Halloween! Hope everyone is having a great day. 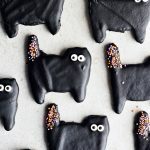 I really wanted to make some cat cookies for you guys, because 1) I love cats 2) and cookies and 3) it’s Halloween and cats are pretty much obligatory. A random bit of info: it’s also Reformation day here in Slovenia and it’s officially a work free day, although certain supermarkets were opened till 3 in the afternoon. But tomorrow is a work free day too and I love it. I like public holidays because our area gets a lot quieter on off days. It’s a complete 180 to the usual traffic and people everywhere. Back to Halloween. My days haven’t been that Halloween-y, apart from eating all the chocolate. We went to a chocolate fair and picked up a lot of interestingly flavored chocolates and Halloween candy was already on sale at the store so of course I took advantage of that too. Yes, I like chocolate a little too much. What I really wanted to do these last few days was watch some spooky movies, but instead Rok and I spent the majority of time putting together new furniture. I hate doing that but I always love the end result. While I still have to work on the kitchen area, I’m excited to get more shelves because I desperately need them. I need more space for all the baking pans and glasses and allll the sprinkles. But before my kitchen goes back to normal, or a new normal, let’s talk about cookies. 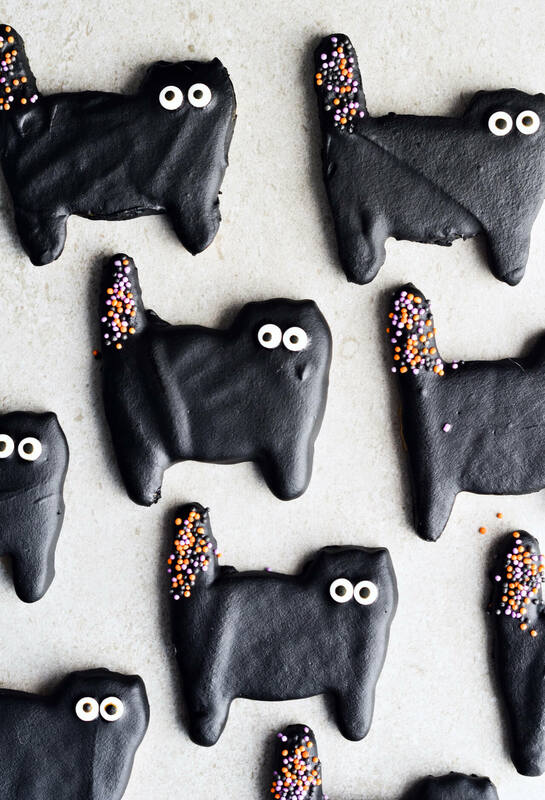 These dark chocolate cat cookies are honestly so good. They’re sugar cookies dipped in bittersweet, black chocolate and decorated with sprinkles. Not that many, but they’re scattered in all the right places I think. I love the purple-orange-black Halloween sprinkles so much. 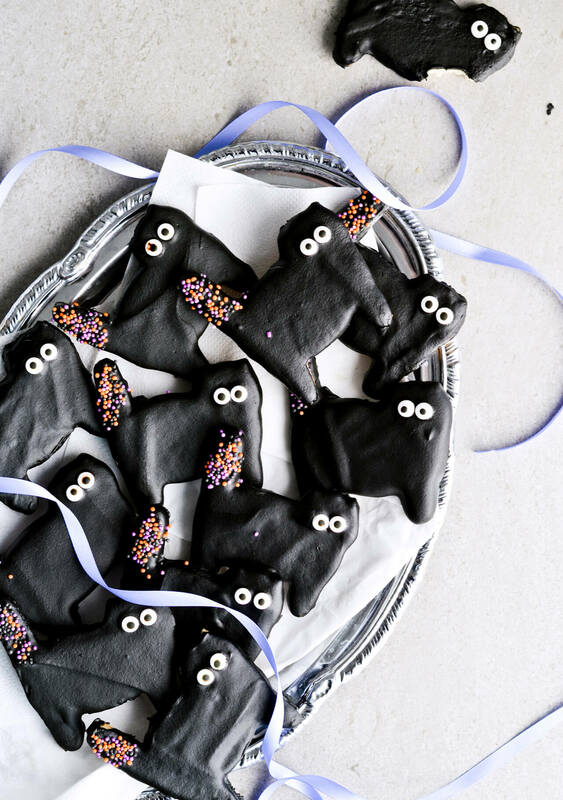 And the mini eyeball sprinkles, wow! 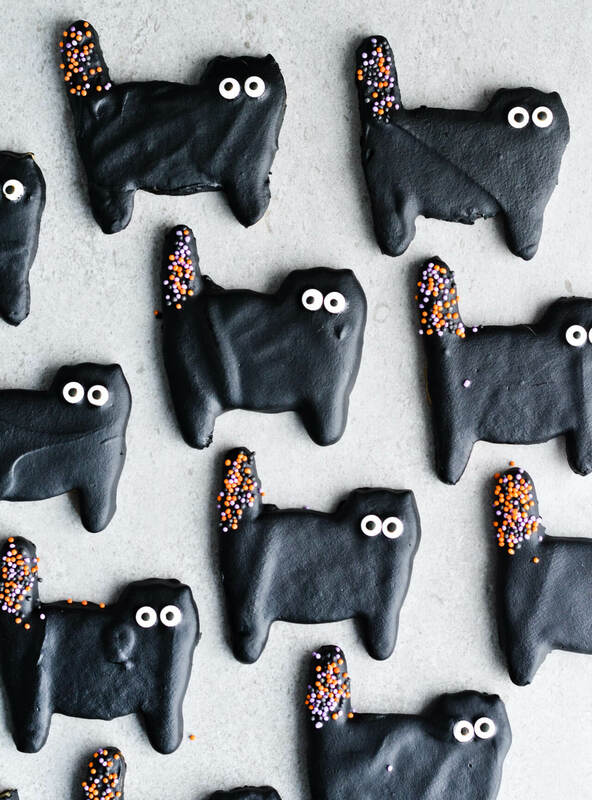 They’re okay when you first look at them on their own, but really shine on a cookie and I love how the cats turned out with these mini eyes. I think they kind of look like Simon’s cat. Please tell me you see that too? I admit I like sugar cookies plain, I don’t need any icing or chocolate and am perfectly happy to eat them just as they are. Preferably as they’re still warm, straight out of the oven. 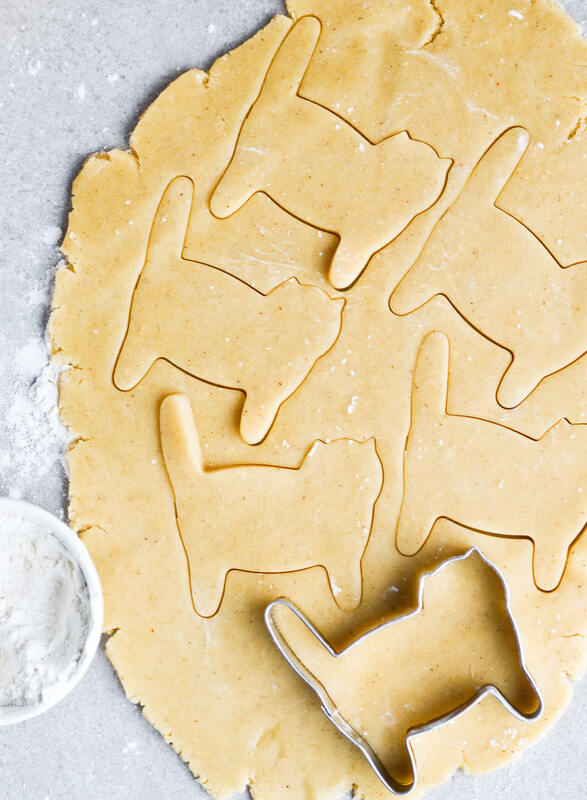 But that cat cookie cutter just might me my favorite one ever and I want to use it all the time. Even for savory food, like these cheesy crackers. 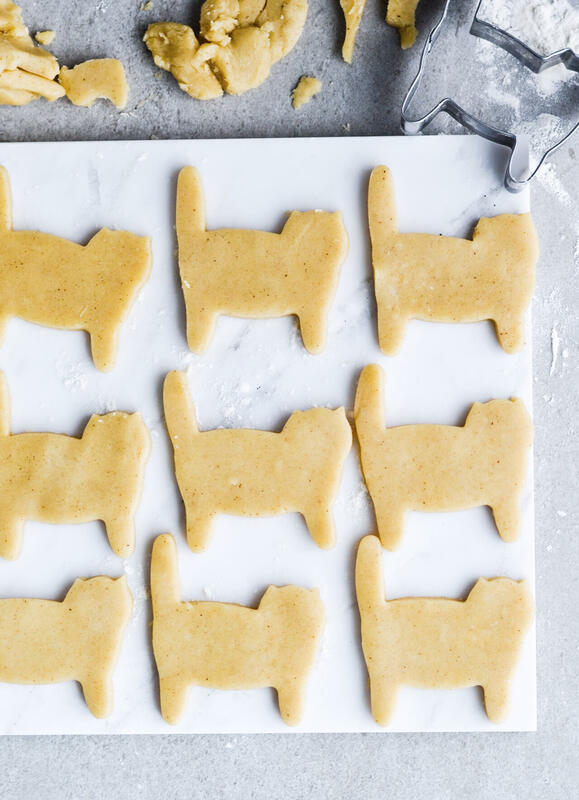 So, you may not like cats as much as I do (I have three cats after all), but I think cat cookies should be loved by everyone. They’re just too adorable. And speaking of my 3 cats, Kim joined me for the photoshoot. Dark chocolate cat cookies really aren’t her thing, but jumping on tables totally is. Fergie and Peggy crashed my session too, but Fergie is too much of a klutz to be allowed on the table and Peggy is too skittish to stay in one place too long. 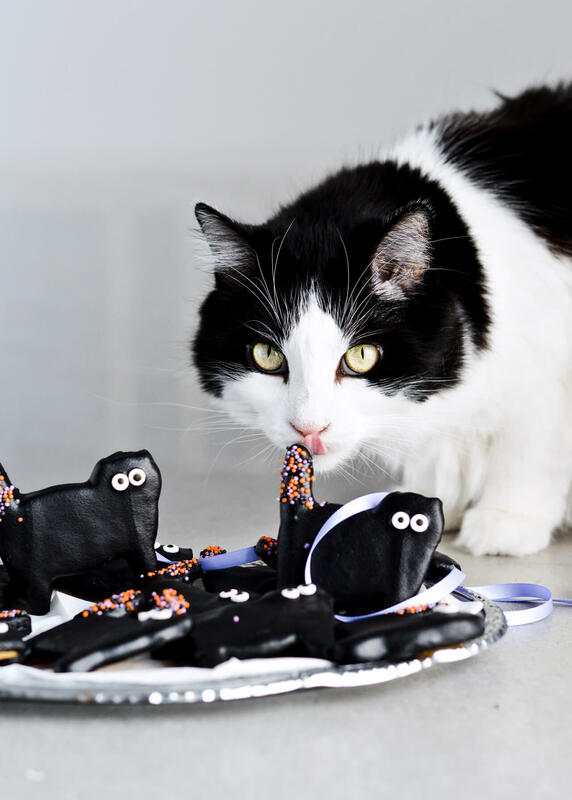 All in all, Halloween rocks, as do cat cookies and all things cat related. Enjoy today as much as you can, because it’s November tomorrow, which means it’s Christmas the day after tomorrow. 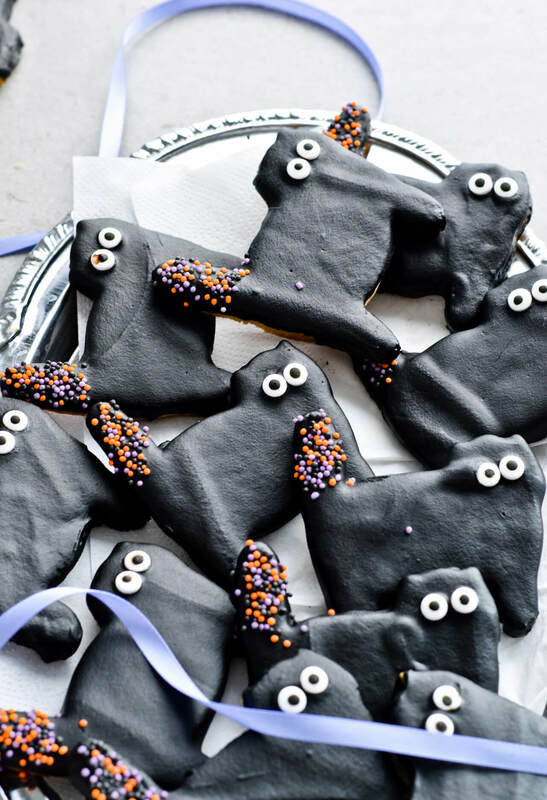 Cute and delicious = perfect cookies! Recipe makes at least 24 cookies. In a small bowl, whisk together flour and salt and set aside. (If you’re using vanilla powder, stir it into the flour now.) In a large mixing bowl, beat butter and sugar until fluffy and pale. Beat in egg, then vanilla bean paste. Fold in the flour and mix just until combined. Form dough into a ball, split in 2, then flatten each portion into a disk and wrap in plastic wrap. Chill in the fridge until firm, at least 1 hour or up to 3 days. Preheat oven to 177°C (350°F) with a rack in the middle of the oven. Line two baking sheets with parchment paper and set aside. Lightly flour your work surface and rolling pin, then roll out one disk of dough, about 6mm (1/4 inch) thick. 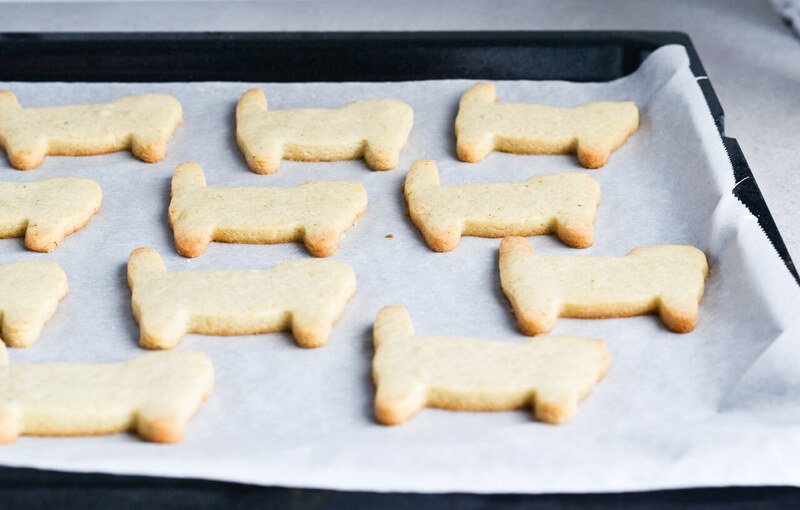 Cut out as many cookies as possible and transfer them to a baking sheet, about 2,5cm (1 inch) apart. Bake for 10-12 minutes, until the edges are golden, but the tops remain pale. As the first batch bakes, gather scraps of dough and form into a disk, chill until firm enough to reroll and make more cookies. Also roll out the second disk of dough, cut out and chill cookies until the first batch is baked. 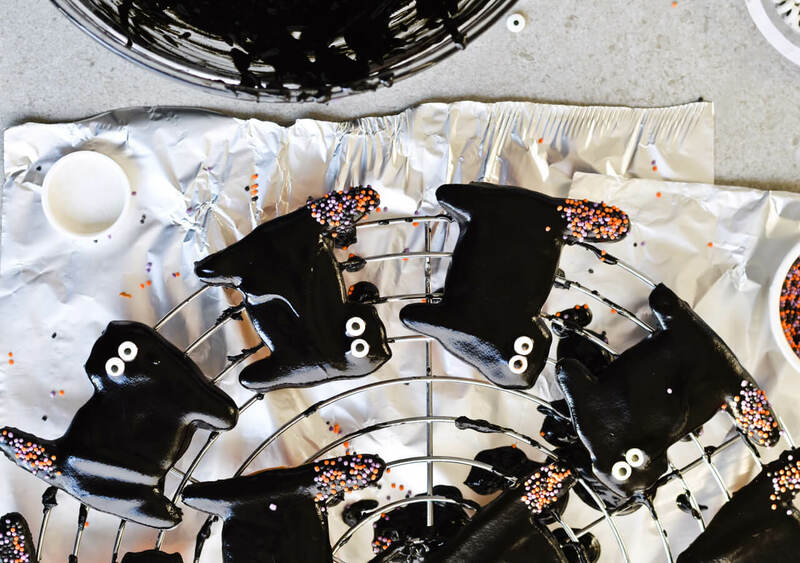 Transfer baked cookies to a cooling rack to cool completely. 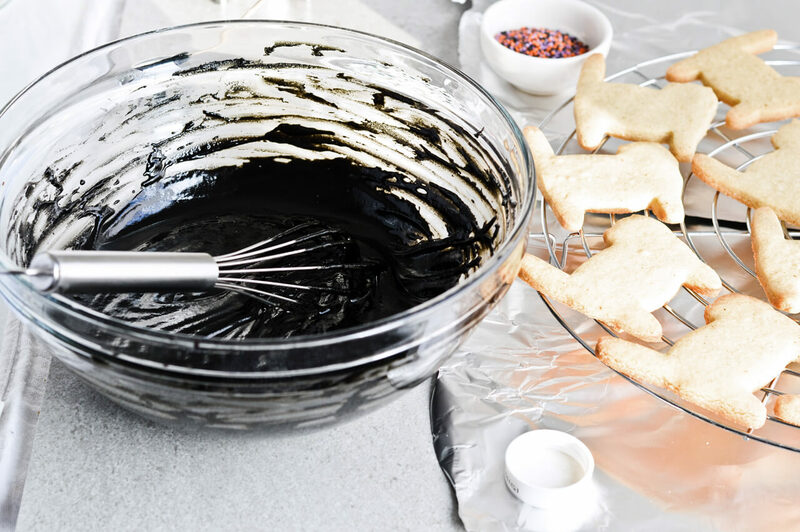 Put chocolate, coconut oil and a few drops of black food coloring in a heatproof bowl and place it over a saucepan of simmering water. When most of the chocolate is melted, remove the bowl from heat and wipe the bottom with a kitchen towel. Gently stir the chocolate with a whisk. If it’s not dark enough, add more coloring. If it’s not runny enough, add more coconut oil or even boiling water. Because you want the chocolate to be smooth and spreadable, so you can shake off the excess chocolate after dipping. Take each cookie, dip it into chocolate (top side down), shake off the excess and transfer to a cooling rack. Add the eyes and sprinkles all over the cat’s tail. Continue with the rest of the cookies. Finally, chill cookies in the fridge until the chocolate hardens. Store covered in the fridge for up to a week. it looks amazing but unfortunately i have to avoid coconut oil, how can i replace it? I found your cutter tonite on ebay uk.Seller is middlesex2012. Thank you so much for telling me, Teresa!